Butan refugees Khadga Poudel, Deuki Maya, Afghanistan refugee Karinh Rahmani and Butan refugee Khadka Budathoki and Afghanistan refugee Hameeda Hameeda. A simple program of familiarisation and information is improving the healthcare experiences of newly arrived migrants and refugees at Westmead and Blacktown hospitals. Bridging the Gap focuses on introducing newly arrived refugees and migrants to local health services and to reduce anxiety and hesitations about engaging with unknown hospital practices. It provides explanations of different health pathways including the roles of GPs, community services and the hospital admission process and outpatient services. The program empowers refugees and newly arrived migrants to make choices around their healthcare and helps staff to understand how to support and care for culturally and linguistically diverse patients and clients. The program started at Blacktown Hospital in 2015, then expanded to Westmead in 2016. There are plans to extend it to Mount Druitt Hospital soon, said Western Sydney Local Health District’s Multicultural Health Service manager Monika Latanik. “Initially we focused on students from Evans and Holroyd Intensive English centres with the view that they would take the lessons learnt from the orientation back to their families,” she said. Since 2015 Multicultural Health Services has delivered Bridging the Gap to 23 diverse groups and more than 450 individuals. 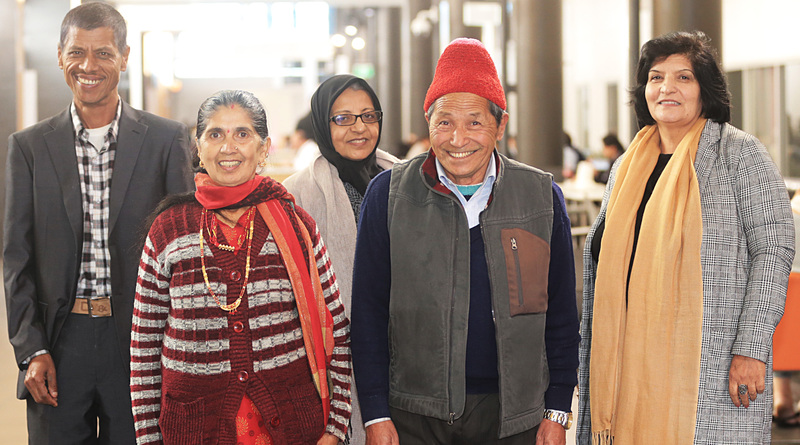 More than 60 refugees from Syria, Iraq, Nepal, Sri Lanka, Iran and Afghanistan recently visited Blacktown Hospital as part of an orientation program in partnership with SydWest Multicultural Services and Westmead Hospital also hosted two large groups of refugees, mainly from Syria. They spoke to staff in the emergency department, imaging, physiotherapy, the carer program, outpatient and women’s health clinics and the respiratory ward, as well as learning about the support offered by the social work department. Bridging the Gap has had enormous success in helping newly arrived migrants and refugees learn about health pathways. “The interaction with our staff gives people a better understanding of our medical procedures and reduces anxiety which is sometimes felt in unfamiliar clinical environments,” Monika said. “We encourage everyone to ask many questions and have found that the experience of observing real-time work and care and speaking to staff builds a positive attitude towards us. This in turn, benefits our staff too. “The opportunity to visit and interact with health professionals also motivates participants to consider potential future career opportunities in health. “Many participants said the visits were beneficial by learning about the referral process for clinics and the triage process for the emergency departments. Another benefit they found was the importance of having a family GP and knowing that after-hours care options are available.